In this tutorial, you’ll learn how to use the INT function in Excel. 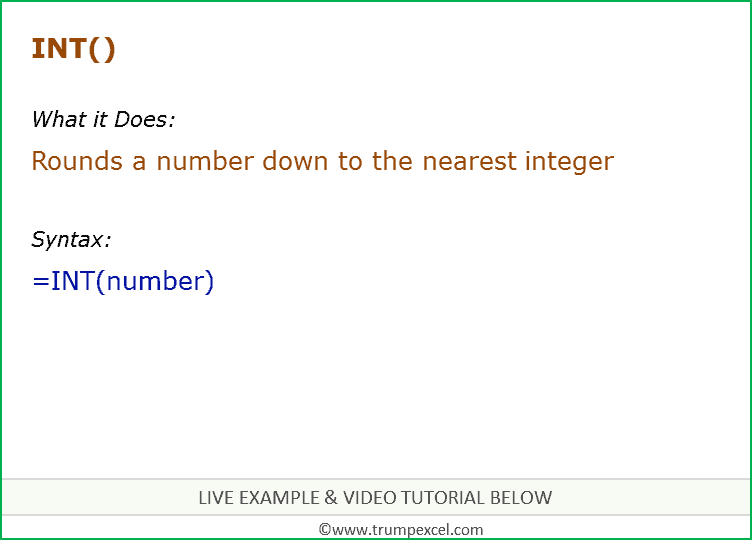 INT Function is used when you want to get the integer portion of a number. It returns an integer number. number – the number for which you want to get the integer value. 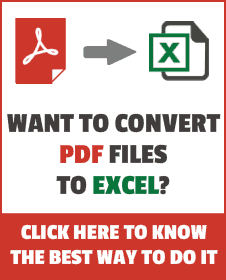 Below are three examples of using the INT function in Excel. When you use INT function with a positive integer, it discards the decimal part and gives you the integer part of the number. For example, in the above example, it returns 4 as the function rounds down the value in cell A2. When you use the INT function with a negative number, it rounds down the number. This means that you get the number which is lower that the given number. In the above example, the result is -5, which is lower than -4.89. So instead of giving you the integer part (as it did in Example 1), it gives you the number which is an integer and lower than the given number. You can use the INT function to get the age of a person using their date of birth. To do this, you need to use it along with TODAY and YEARFRAC functions. YEARFRAC formula takes the date of birth and the current date (which is given by the TODAY function) and returns the age in years. It has the integer as well as the fraction part. Then the INT function returns only the integer part from it.